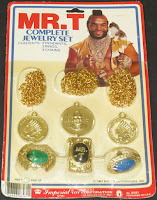 Mr. T gold jewelry, chains, rings, and bracelets was worth about $125,000 and weigh 6.25 pounds. 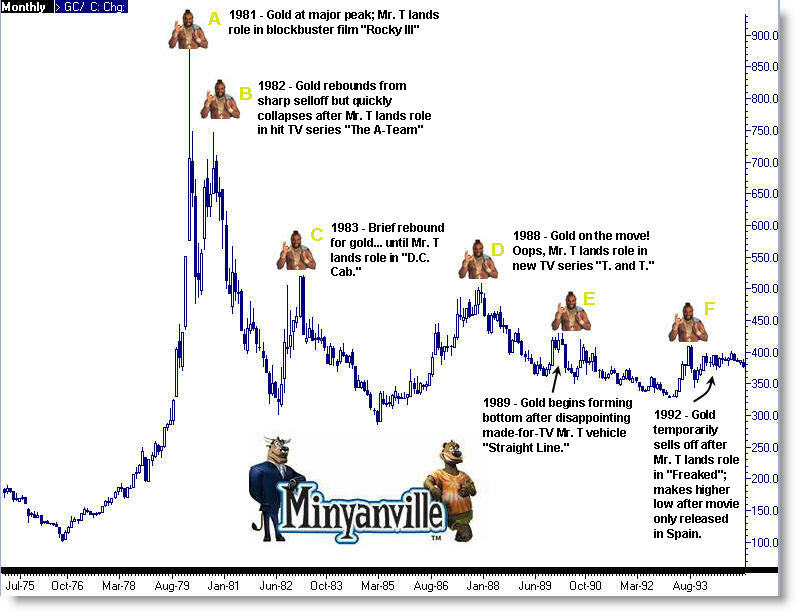 In January 1983 when the A-Team first went on the air, Mr. T's approximate 100 ounces (6.25 pounds) of gold was worth $43,316. 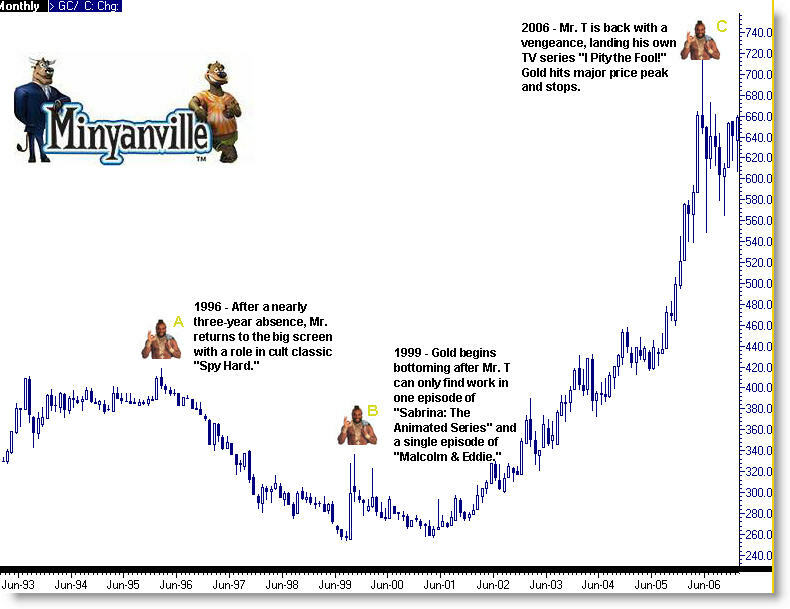 It's now said to be worth $123,480 - an increase of 185% in value, as of 2010. 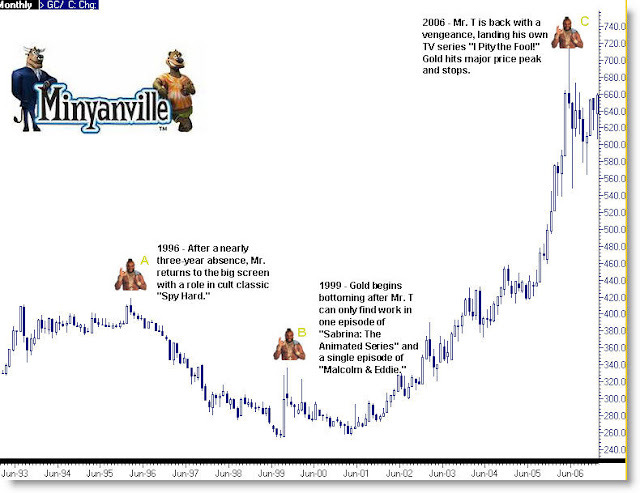 Some people even speculated that Mr. T had an influence on Gold price fluctuation. 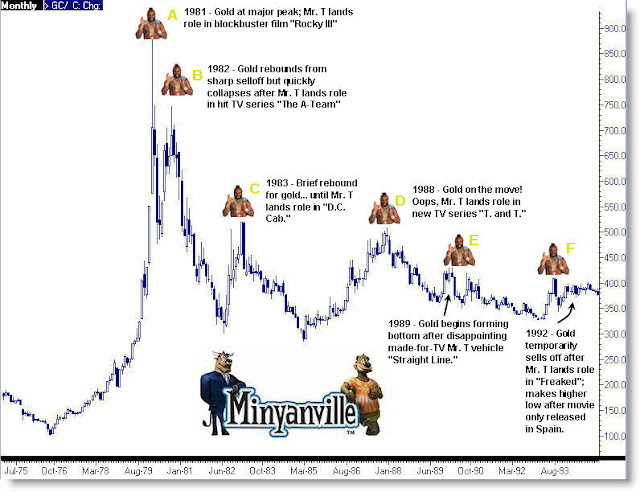 Mr. T was a hero and a manly role model for the children. Not a sissy like today's heroes for children. 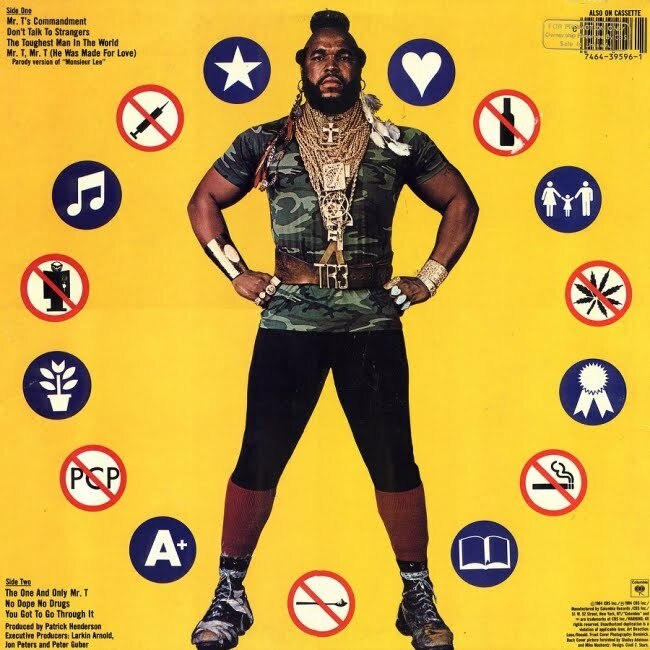 Mr. T has some explanation for everything he wears. He bought his first gold chain in 1977 which cost him $129. 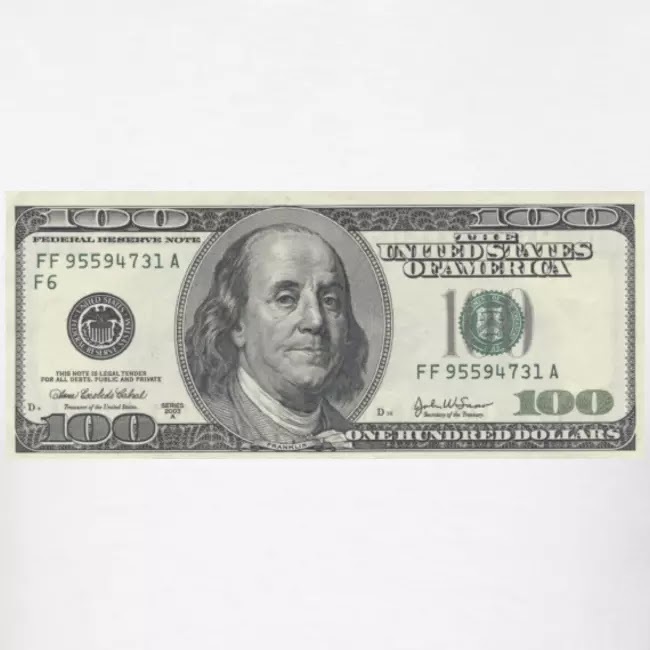 He uses the diamond and gold Rolex he bought for $8,000 cash at a Federal Marshal's auction to keep the time (although the date does not seem to work). He eats his meals with the huge gold eating utensils around his neck. He takes his drink from a gold and diamond goblet, the idea for which he got from the Pope. The reason why I wear gold: I wear gold for three reasons. One, when Jesus was born, three wise men came from the east, one brought frankenscence, one brought myrrh, the other one brought gold. 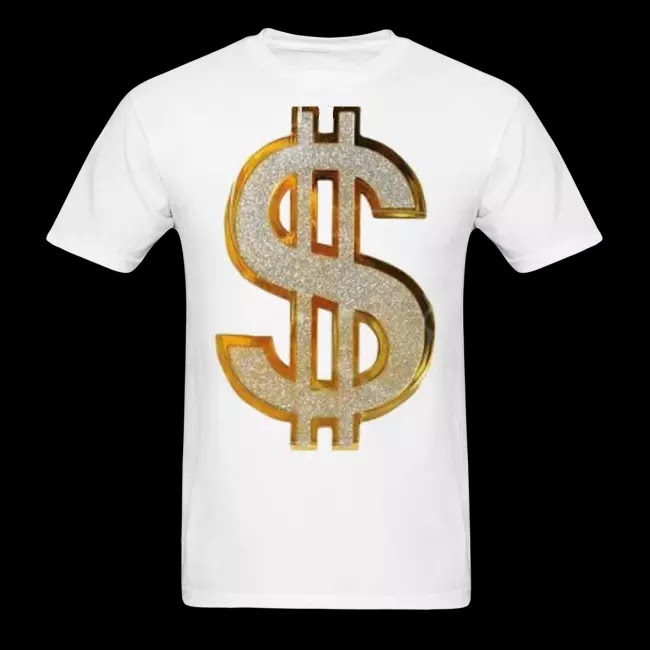 The second reason I wear gold is I can afford it. The third reason I wear it, it's symbolic of my African heritage. When my ancestors came from Africa, they were shackled by our neck, our wrists and our ankles in steel chains. I've turned those steel chains into gold to symbolize the fact that I'm still a slave, only my price tag is higher. 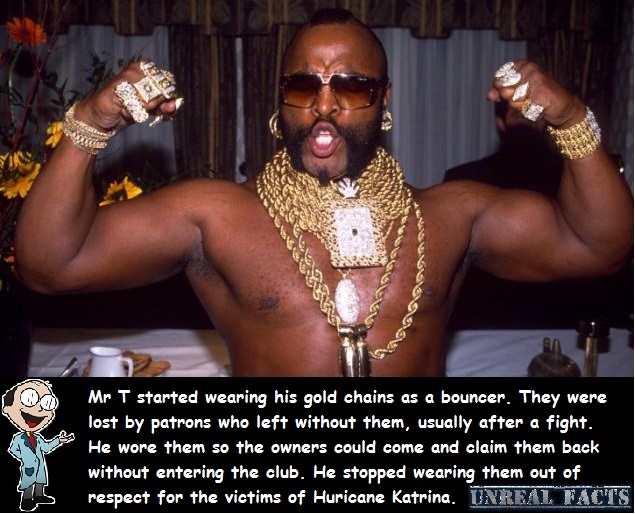 Mr. T stopped wearing gold chains in 2005 because he thought it would be an insult to the people who lost everything after Hurricane Katrina. 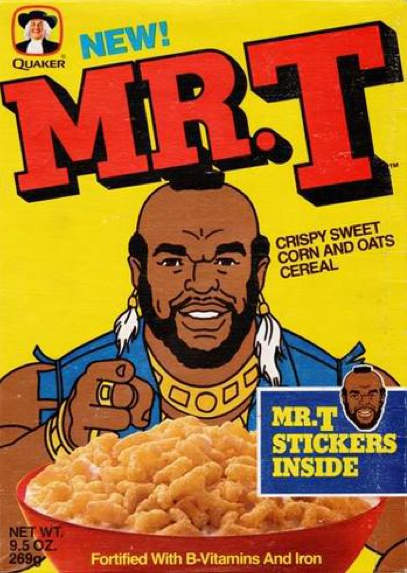 Sorry to say that but Mr. T without bling is not Mr. T anymore. 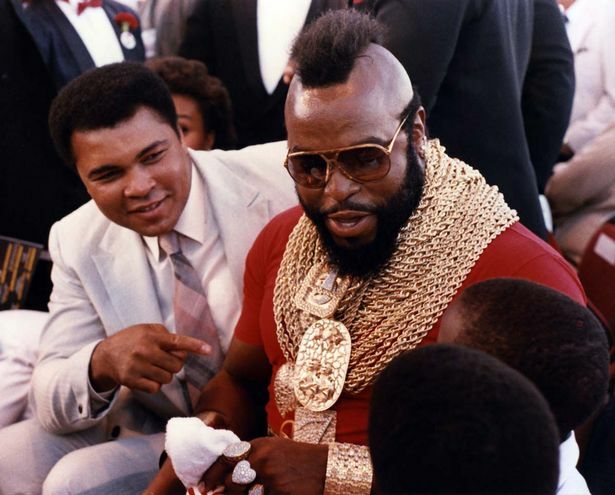 "The Greatest" Muhammad Ali, his former bodyguard Mr.T and Mr.T's gold jewelry. If you don't have Mr. T deep pocket.